Crow's Nest redirects here. For other uses, see Crow's Nest (disambiguation). Crow's Nest was a UNSC airbase in Kenya, Africa, located close to the city of Voi. It was a command center for local UNSC forces in Kenya late into the Battle of Earth in November 2552. During the battle, the base was under the command of Commander Miranda Keyes. Crow's Nest was constructed as a bunker complex for an unspecified war that evidently took place in the 20th century. The hill and the Crow's Nest lie about 25 kilometers west of Voi, and a few kilometers north of Tsavo Highway. Small bunkers are located in the area surrounding Chawia Hill and along Tsavo Highway nearby. These bunkers bear numeric designations such as 6 and F6. The southern hangar had no true runway to speak of, so it strictly supported only VTOL aircraft such as Pelicans and Hornets. There were multiple landing pads situated both underground and above ground. In several locations throughout the base, NATO compasses could still be seen on the walls. Because of its age, the base often frustrated UNSC personnel in the 26th century because it required constant maintenance and employed outdated technology, one example of which was evidenced in the controls for its doors. During the Battle of Voi it was used for its proximity to what the UNSC thought might be the Ark, but was in reality the portal to the Ark. Crow's Nest was also a well-fortified location that provided some relative protection from aerial and orbital bombardment. From it, the UNSC coordinated its asymmetrical resistance efforts in the region surrounding what remained of New Mombasa and the local countryside. 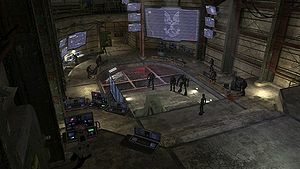 During the Battle of Voi, Crow's Nest was used as a command base for the UNSC forces in the immediate area, which included those from Tsavo, Mombasa, and Arusha. Many wounded Marines that survived encounters with Covenant patrols were sent to the base for medical treatment. The able-bodied soldiers at the base were organized into fireteams that were spread throughout the base. When Master Chief John-117, Thel 'Vadam, and Sergeant Major Avery Johnson arrived at the base on November 17, 2552, Fleet Admiral Hood briefed them, along with the command staff, about a low-level assault on Covenant warships stationed over the Excession at Voi. Hood was interrupted when the base's communications were hacked and a transmission from the Prophet of Truth played, declaring that humanity was doomed to destruction. At the conclusion of his message, the forces at the base mobilized to defend it, anticipating an imminent attack from the Covenant. It wasn't long until the decision was made to evacuate the facility, as well as to destroy it in the process with a bomb. Having successfully destroyed the facility and denied it to the Covenant, the survivors left in M12 Warthog LRVs and M831 Warthogs. While the majority of the base was utterly destroyed, the motor pool and cave leading to it from Tsavo Highway, along with some outer hangars, remained intact. After the war, the UNSC would create a number of War Games simulations based on Crow's Nest, for Spartan-IV training. "Rat's Nest" is a faithful recreation of an ammunition storage facility high inside the base. The name "Crow's Nest" originates from a ship's lookout position, located near the mast. Crow's Nest and Voi are the only specific locations that are each featured in two different levels in the Halo 3 campaign. In the final cutscene of the previous level, Crow's Nest is wrongly depicted to be located near the base of Mount Kilimajaro, when actually it is at least 90 kilometers East. In Halo 3, a Marine states that the base was built for "some 20th-century war". A snippet of dialog cut from the final game expands on this, with another Marine claiming that the conflict in question was World War II. This is unlikely to be the case, however, as Kenya was not involved in World War II to the extent as to warrant the construction of a facility as extensive as Crow's Nest; given the region's lack of involvement in large-scale conflicts as of the early 21st century it is more likely that the base was actually constructed at some point later on. Concept art of the interior of the base. Concept art of the base's Pelican bay, with the savannahs of Voi stretching out below. A schematic of the base, with the Seventh Column symbol visible on the screen. The Pelican bay of the base. Chawia hill in the background. A door in the base. One of the exterior gates outside Crow's Nest. Full view of the Pelican bay in Crow's Nest. Kilo 023 at Landing Pad Bravo.